Watch Mark Zuckerberg Live With Developers In Nigeria. One of the world richest man and founder of Facebook Mark Zuckerberg has arrived in Nigeria. The 32-year-old billionaire’s is currently at Co-Creation Hub (CcHub) in Yaba. Watch Mark Zuckerberg Live in Nigeria. 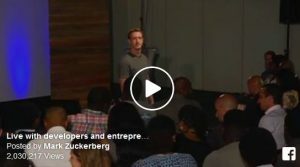 You can now watch Mark Zuckerberg Live With Developers In Nigeria as he is checking out how to improve on technologies in Africa.